Noah has a Santa obsession. To the point where I had to hide his special Santa pj’s because he wanted to wear them to school everyday. At one point at dinner we started saying something that sounded like Merry Christmas (I have no idea what now) but he started in. DH added “Ho Ho Ho” and things really got rolling. Baby Movement? Small thumps here and there. I’d expected something stronger by now but I think this babe is sitting back further. Belly button in or out? In. It stayed in the whole time with Noah and I figure it will with this one too. I wear sunglasses at night…. So, many of my fbook friends are already up to speed on this whole saga but for the past month it seems, Noah’s sleep was in the pooper. He was waking up in the middle of the night hysterical and we ended up sleeping in the rocking chair with him more often than not (or I’d be on the floor with my hands thru the side of the crib). DH and I started to discuss toddler beds and what we’re going to do. Noah’s crib has the option to convert to a toddler bed with a new rail. Thinking that it would be a good transition, I went to BRU and ordered it up. They said it would take 10 – 12 weeks to get here – that evening (that evening!) he managed to make it over the rail and each night the rest of the week. There goes that idea so off we went that weekend to get him a twin bed. We made a big deal about the change over by buying cool dinosaur sheets (and not letting him see us disassemble the crib) and talking it up all thru the buying process. He’s been in the twin for almost a month now and things are going okay. He’s still struggling to get to sleep at night (naps are near impossible). We put a new gate in to make it easier to get in and out since we have to go in like 100 times a night to put him back in bed. Alot of times I’ll climb in with him and just fall asleep too which I know is a terrible habit but when it’s 10pm and he’s still running like a maniac, you’ll try anything! I know it’s just a matter of time before the bed loses it’s magic and he’ll be more willing to just lay down and go to sleep but for now we do alot of back and forth. In the end he really seems to enjoy it so I’m happy we made the switch and went straight to the twin. I tried to get a few pictures of him but he wasn’t cooperating so you just get the two below! Noah has a habit of pulling up my shirt to kiss my belly…cute at home, not so much in the middle of the supermarket. Baby Movement? Again, thinking I felt a few more thumps, more distinct this time than last week. Okay, as I’m weeding thru all the pictures from our cruise I have to share this story about Noah. He’ll totally kill me when he’s older but I still laugh thinking about it. Here’s the scene: We were in the Miami airport getting ready to come home. The gate area is full to the brim with people because we board in just a few min and Noah’s standing there with his hand down the back of his pants (this is a new habit…ugh). I ask him nicely to take his hand out of his pants and he looks at me and smiles…(in the back of my mind I’m thinking…”hmm…glad there aren’t any poopies in there”…and now you can see where this is going). He whips out his hand and yells “poopies! !” with as much volume and glee as his little body could project. Yes, there he was, hand covered in poop, in the middle of the gate area with 100’s of people around us. DH was mortified but quick on the trigger and grabbed the napkins next to him, wrapped up the poopy hand and then passed him off to me to go clean up. I couldn’t stop laughing. As I run and get Noah cleaned, DH sits back to survey the horrified faces around us. Only, there were none. No one had noticed (or if they did they didn’t make it obvious). Phew….I came back and he was laughing hysterically at the comedy of it all. 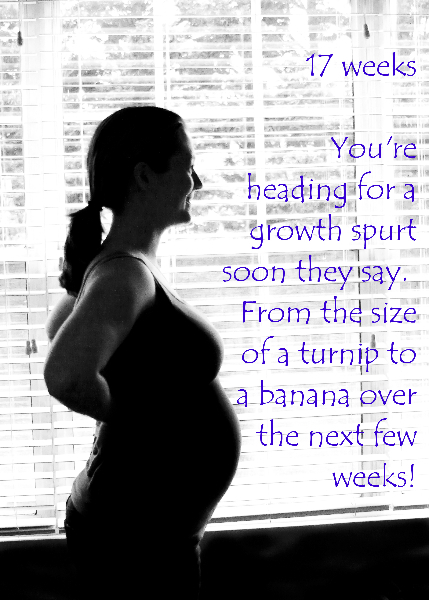 We’re back from our cruise and settling into the second trimester. Unfortunately, the headaches that plagued me in my second tri with Noah seems to be back for this baby. Total Weight gain/loss? My next dr’s appt isn’t until the 27th so we’ll know more then. It doesn’t feel like I’ve gained a ton but I suppose we’ll see. The food on the cruise was good! Baby Movement? Thought I felt a thump or a drop last night but I’m not sure. I think this baby is sitting a little further back because I have a hard time finding the heartbeat on my doppler. Food Cravings?Really nothing…it’s kind of odd. Milestones? Passed the first trimester screen and have been deemed low risk. Out of the first trimester, woohoo! Now, just waiting for that energy to come back. Total Weight gain/loss? I’d assume I’m up a little but last dr’s appt was +1lb. Best moment this week? We’re crusin as a family in the Caribbean!! Food Cravings?I was too nauseous on the boat to really want to eat. The rest of the time I was chasing Noah around. Since we were on vaca I didn’t take a pic so you’ll have to image me with a big ole belly (that looks way too big to be 14 weeks). And so it starts again! Dec 3 we got the ever so faint second line on a pregnancy test which heralded the impending arrival of Noah’s sibling. It was so faint that I had to wake DH up and ask for his eyes to verify. Cautious as he was he concurred that he saw a second line but told me not to get excited until we see that for a few days straight. So, for the next week I went thru all the tests we had in our house (which was a surprisingly large amt, I guess I unknowingly collected a bunch) and they all said the same thing – pregnant! This was our third and final round of Clomid (I told DH I was done, if this didn’t work we’d just have to wait until July to get on his insurance and see the RE again..) and I could have sworn our timing was way off so to say I was surprised when that second line appeared at 13dpo is an understatement. After the shock wore off it was replaced by excitement (and nausea…oh joy!). Symptom wise things have been pretty easy. Some mild nausea here and there but nothing too bad. Sore bb’s, the likes of which I’ve never felt before – just breathing hurts on some days. The bloat started around week 4 and even at week 8/9 I look like I did at 12 with Noah. Our first ultrasound showed a little bean at 7w3d on first look and the doc revised it to 7w5d by the end of the appt. 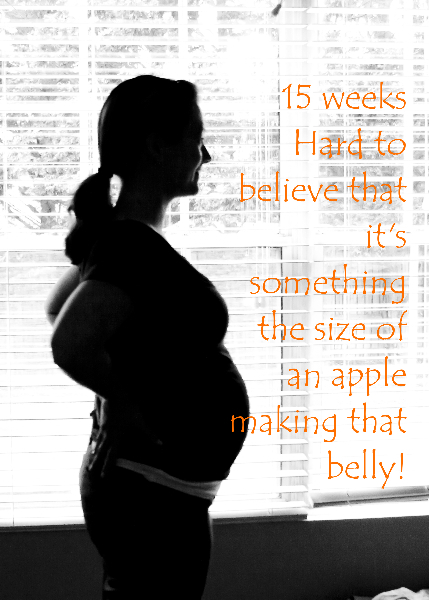 Still a few days shy of the 8 weeks we thought we were but he said we were close enough to stick with the 8/6 due date. 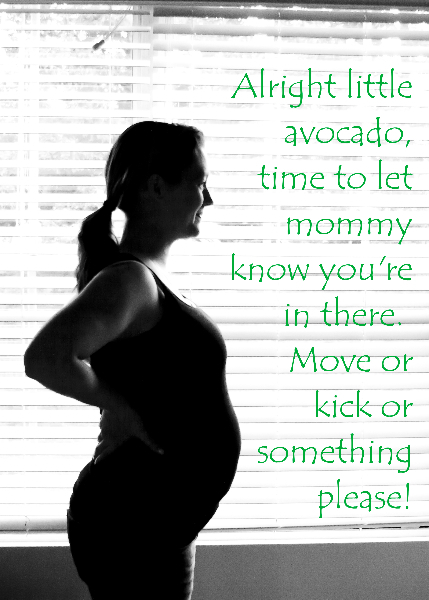 I think it was then that it finally hit me – we’re having another baby! So far we’ve kept this a little quite, not nearly as quiet as when we had Noah (when no one but our parents knew before 13 weeks). DH let it slip to my gram on New Years which resulted in us telling the whole house full of people but that’s fine. Things have been going well and I wasn’t super worried (besides, it would be nice to have the support if we needed it later). So, I can’t guarantee the blogging will increase with this new revelation but I will try to keep folks posted as we move along. It’s already so different with this one. Most days I forget I’m even pregnant (until I look down to see the bump). Perhaps it’s because I’m distracted by an almost 2 year old who’s fighting sleep and asserting his independence and is in non stop motion. Well, you finally did it. You climbed over your crib rail and let yourself out of bed. We’ve spent the last few weeks trying various things to keep you in. A sleep sack worked for one night and then you figured that out too. Now it’s hit or miss on if you’ll get out or not. The gate is up so you can’t wander but we need to find a better solution soon, i’m nervous about you getting in and out by yourself. You always tell us it’s “cold outside” in reference to anything cold or outside but not always necessarily together. Like, you’ll grab daddy’s face after he comes in from outside and say “cold outside” or you’ll grab your milk and say “cold outside”…doesn’t matter. Any reference to cold is appended with “outside”. I love it! You’re asserting your independence more and more. Most days you have to pick out your own clothes. You strip off everything I pick out and insist on doing yourself so I’ve kind of given up. You even wore PJ’s to school today because it wasn’t worth the fight. Dinner time is much of the same. You have to do it yourself or ask for help. If I offer or try to do it for you all hell breaks loose. It’s so cute when you ask for help though…you look up and say “hep mommy” and then I melt. I plopped you on the scale the other day (after you brought it out to me) and you were 28 lbs. Then I managed to get you to stand still long enough to get a height. 34 inches…almost a full yard!!! We’ll find out at your dr’s appt next month where that puts you. I’ve moved you over to 24/2T clothes for the most part although you still wear some of your 18mo PJ’s. Lastly, your temper has arrived. I’m attributing it to the early arrivals of the terrible 2’s or possibly the sleep issues we’ve been fighting but man – you can be sweet as pie one second and the next a raging ball of anger hitting and throwing and just yelling like some’s stole your favorite toy. There’s no rhyme or reason most times. Sometimes it’s because I did something that you wanted to do yourself (like open your yougurt) or we had to take a non-permitted object out of your hands (like the screwdriver or the sharpie marker that I really need to remember to take out of the drawer you can reach). Sometimes it’s becuase Macie looks at you cross eyed…or uses her jedi mind tricks to make you think she’s going to steal a toy. I don’t know why most times and often times a modified time out is the only fix (or a bottle of milk, which seems to cure alot). Your MeeMa would say that it’s payback for all the tantrums I threw as a kid (apparently I could throw a fit with the best of them) and perhaps she’s right. Wow, I can totally feel her pain now. In any case, you always make it better you saying “sorry mommy” (or whatever object you threw) and petting my face (or the object you tossed:) ). Being your mommy is challenging alot of the time but so incredibly worth it. (and since I’ve been seriously slacking on the photos, here’s a video of Noah’s new trick. I have no idea who taught him this).